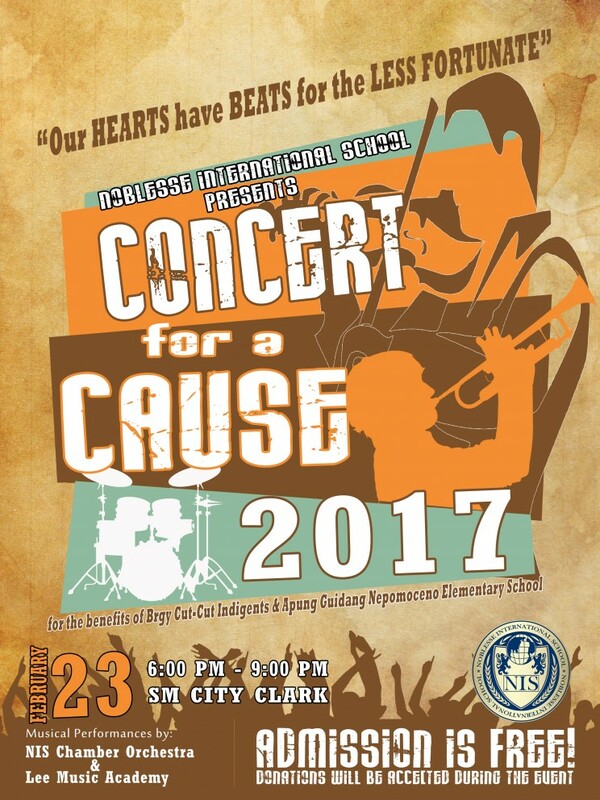 One again, the Noblesse International School will be organizing its Annual CHARITY CONCERT to be held on 23rd of February 2017 at the Activity Centre, SM Clark. The concert will feature performances from our talented students who are vigorous members of NIS Chamber Orchestra. We will have a special participation of the “Lee Music Academy” from South Korea, where young musicians and recitalists perform like professionals. The benefit concert series for a cause will be a most rewarding method of raising funds. Not only we build local awareness and gain support for our school, we’ll also get to enjoy some great music in the process. The organizers are currently inviting NIS community and we’re seeking support and involvement in the said event. The sponsorship forms are available in the office. All sponsors will be recognized on signage and other types of advertisements at the level at which they choose to participate. Again, this is a unique opportunity to contribute to the improvement of the local community through recognizing and showcasing the innate talents of the young ones. We are looking forward in advance for your support and participation. Should anyone has further inquiry, kindly feel free to contact Mr. Arvin Daquiz, the Marketing Coordinator through 0932-850-1154 or 045-459-9000 or email us in [email protected] for more information. Save the date and see you all!